The psoas major is a mysterious, complex, and often misunderstood muscle that runs from the thoracic spine to the lumbar vertebrae and the lesser trochanter of the femur. 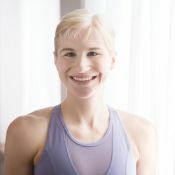 Join Kat as she explores 4 popular postures that make the psoas more supple. Her tips on how to correct some common misalignments will be helpful to yoga teachers and students alike. For this class you'll need: cushion for the head (optional) and yoga block.